Julian Lines is the Engineer and Owner of Digital Angel Mastering. 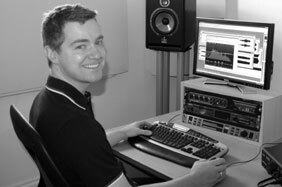 Julian has been working in the audio post production industry for the last 25 years. He first got interested in mastering whilst working for Tape One mastering studios approx 20 years ago. He has also worked for Goldcrest post production, SVC Television, VTR post production, Saunders and Gordon Sound Studios and the BBC as an Audio / Broadcast Engineer. Julian is very thorough, conscientious and has an excellent eye (and ear!) for detail, he has been writing, producing and recording music for over 20 years and has formed and played guitar in several bands. Whether they are budget demos or high end studio recordings Julian and Digital Angel Mastering can enhance and sharpen up your tracks with a little audio magic. Your tracks will be individually mastered, not just run through a standard 'default setup'. For more about mastering and Julian's approach to mastering take a look at the Mastering page. If you haven't used us before or are unsure as to how mastering can improve your tracks - Please send in one of your tracks and I will be happy to send you a free mastering sample. Send it via my Dropbox or any of the other file sharing links on the Home page. Please mark it as 'Sample Required' in the subject line or the message box, along with any other comments you may have.